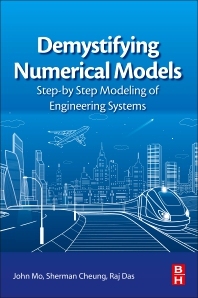 Demystifying Numerical Models: Step-by Step Modeling of Engineering Systems is the perfect guide on the analytic concepts of engineering components and systems. In simplified terms, the book focuses on engineering characteristics and behaviors using numerical methods. Readers will learn how the computational aspects of engineering analysis can be applied to develop various engineering systems to a level that is fit for implementation. Dr. John P.T. Mo is Professor of Manufacturing Engineering and former Discipline Head of Manufacturing and Materials at RMIT University. Prior to joining RMIT, he was Senior Principal Research Scientist in Commonwealth Scientific and Industrial Research Organisation (CSIRO) and led several teams including Manufacturing Systems and Infrastructure Network Systems in the Division of Manufacturing and Infrastructure Technology. His expertise includes system integration and analysis, data communication, sensing and signal diagnostics. In his 11 years in CSIRO, he led a team of professional research staff worked on risks analysis algorithms, electricity market simulation, wireless communication, fault detection and production scheduling. He was the project leader for many large scale government projects including productivity improvement in furnishing industry and consumer goods supply chain integration. Dr. Sherman C.P. Cheung is Associate Professor and Program Manager of Mechanical Engineering at RMIT University. Dr. Cheung is an expert in numerical modelling using Computational Fluid Dynamics (CFD) technique. His expertise includes fire dynamics modelling, multiphase flow modelling, numerical heat and mass transfer and computational optimization algorithms. In the past 15 years of his career, he has actively engaged in various consultancy projects with industrial partners using numerical techniques to perform safety analysis, design optimization, risk analysis and system performance assessment. Dr Raj Das is Associate Professor in the Aerospace and Aviation department and a principal investigator of the ‘Sir Lawrence Wackett Aerospace Research Centre’ of RMIT University, Australia. Dr Das has a PhD from Monash University, Australia in Structural Optimisation and Failure Analysis. Dr Das has previously worked in the University of Auckland, the Commonwealth Scientific and Industrial Research Organisation (CSIRO), and the University of Manchester. Dr Das has research expertise in advanced materials, such as metamaterials, axenic materials, architected materials, composite materials, topology and shape optimisation for materials and structural designs, computational modelling, failure analysis and optimisation. Dr Das has published more than 200 papers in international journals and conferences. He has been the chair of four major scientific conferences recently held Australia and New Zealand. He has served on the scientific committees of more than 80 international conferences. Dr Das is on the editorial board and review panel of several journals and funding agencies.